fully hardy Fascinating pink-tinted flowers with a creamy centre appear from early to midsummer over the mid-green leaves. 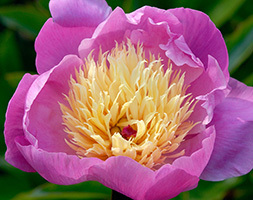 Like a giant anemone, the centres of these extraordinary, scented flowers are packed full of tiny, strap-like petals. An excellent specimen plant for the middle of a border in full sun or partial shade.